Hassett Tax & Financial Services specializes in providing individuals with the technical experience, innovative thinking and personal service they need to help pursue financial security. We evaluate each of our clients expectations and then develop a plan of action to help them work towards their goals and objectives. 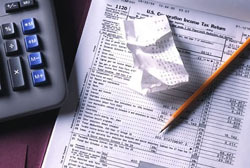 As a firm, we are committed to helping save you more on taxes. We view taxes, not as a transitory year by year burden, but rather as something to be managed and controlled through proper planning.